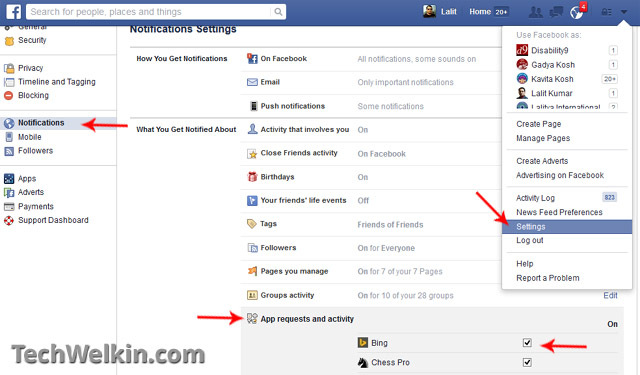 Learn how to stop Candy Crush requests and notifications on Facebook. You can also block Candy Crush Saga, Candy Crush Soda and other such games. Finally it became too much for me to handle and I had to look for a way to stop Candy Crush requests on Facebook. My friends have been asking this question since long. But I never really bothered about the notifications that would come all the time from games like Candy Crush and Candy Crush Saga and Candy Crush Soda and what not! It is really irritating to keep receiving tens of such requests —especially when you’re not interested. There are a large number of FB users wish to block Candy Crush notifications and requests. And sometimes it gets way too much. I have played Candy Crush and I like this game but I play it only when I have time. I don’t play such games for killing time. Professional blogging is a serious business. You can not afford to waste time online with such games. Those who are addicted to this game keep on sending help requests. Candy Crush requests became such nuisance that a large number of jokes and memes have cropped up on Internet. A meme on how irritating Candy Crush requests are. Why do you get Candy Crush Requests? Candy Crush is a game developed for mobile devices by King.com. It is available for various mobile phone platforms like Android and iOS. When someone plays it, Candy Crush brings up certain restrictions which could be easily get around by asking “help” from your Facebook friends. When a player asks such a help, the Facebook friend gets a notification. Also, players keep on inviting their non-player Facebook friends by sending them such notifications. 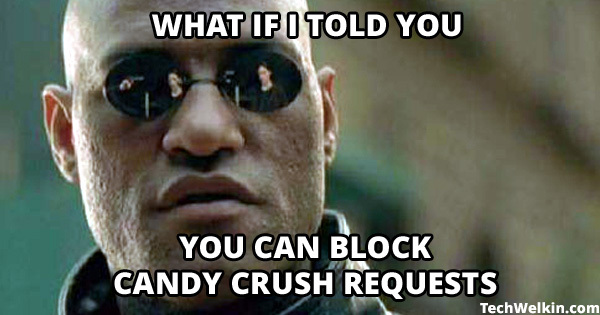 Why would you want to block Candy Crush Request? Well, you would best know the answer to this question! But mostly, people feel irritated as Candy Crush consistently sends large number of notifications and requests. It is one of the most popular mobile game. In future, it may even be considered among the classic computer games. So, you can imagine the huge number of people who are playing it and seeking your help. This large number of unsolicited requests turns out to be a great nuisance on Facebook. When you log into your Facebook account and see that there are 50 notification, you feel curious as to which friends are interacting with you. But when you realize that most of these notifications are actually from games like Candy Crush, you will certainly not feel good about it! How to stop / block Candy Crush Requests and Notification? When you feel like saying “enough is enough”! you can go to the Facebook App Center Game Requests page. Now go to Facebook App Center Game Requests. Stop Candy Crush requests and notifications from Facebook App Center’s Requests page. Now, go to Invitations options. Here you will see the list of notifications that you have received through gaming apps (like Candy Crush). Click on the Ignore All link to ignore all the requests from a particular game. When you’ll click this link, Facebook will ignore and delete the existing request from Candy Crush. Also, Facebook will give you the option of blocking Candy Crush. 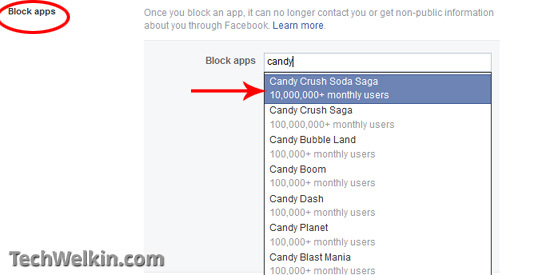 Facebook gives option to block Candy Crush game. Click on block link will stop Candy Crush requests in future. Here under App requests and activity section, you’ll see the list of Apps that are authorized to send you notifications. Now Candy Crush should not be there. But if it still exists in the list, just untick the checkbox and Save Settings. Facebook App Requests and Activity Section. Block any app on Facebook. This will stop the app from sending notifications and requests. As you just saw, it is not difficult to stop Candy Crush requests and notifications. We really suffer the barrage of such notifications only because we don’t explore a way to get rid of them. Mark Zuckerberg has provided options to block all (well, almost all!) nuisances on Facebook. I hope this information was useful for you. Please feel free to let me know if you have any questions on this topic. I will try my best to assist you. Thank you for using TechWelkin! wow this is good thank you. it will not be annoying anymore because i hate candy crush requests. Well I never knew there is way to stop invitation just for candy crush. My friends never want to play candy crush and I need friends! That is one of the bad things about the game that you need friends to get through certain checkpoints in the game. I do still enjoy playing though! I like to play candy crush. How can I stop the app from posting to Facebook on my behalf every time I send a life or reach a new level.. Don’t need the world to know that I play. Candy Crush is designed in this way so that it can advertise itself. The posts it makes attract more people to play it. These are some of the side-effects of playing Candy Crush and other FB games. Thanks, my niece was driving me crazy with notifications. Glad I did not have to block her. Thanks for the way to block the candy crush requests and notifications. It is irritating always to get game notification.